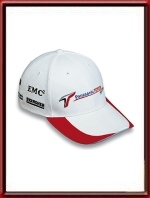 Official Toyota F1 team hat, White. This is the team cap with sponsor logos. 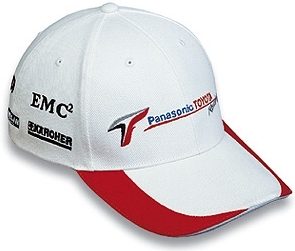 It features theToyota F1 Panasonic logo on the front. Furthermore, it features the following sponsor logos embroidered around the the whole cap: Esso, Intel, Magneti Marelli, Ebbon DACS, Denso, KDDI, Michelin, EMC2 and Karcher. One size fits all with Velco adjustment strap. A MUST for any Toyota fan! This is of course officially licensed Toyota Merchandise.